Be the first to share your favorite memory, photo or story of Burdette. This memorial page is dedicated for family, friends and future generations to celebrate the life of their loved one. Burt Lee, 84, passed away peacefully on April 1, 2019. Burt leaves behind his loving Wife Fran and Children: Vicky (Bob) Tarbox, Burt Jr. (Brenda) Lee, Francine (Les) Spicer, and Candy Barklow; Grandchildren: Brandy Simpson, Robert Tarbox, Danielle Shirkey, Austin Lee, Ava Lee, Josh Spicer, and Justin Spicer; Great Grandchild, Stephen Simpson II. 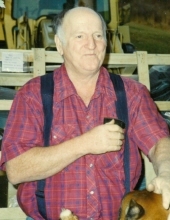 He owned and operated his building and excavating business for 61 years with his wife and son. Over the years, he built many dairy barns, homes, and commercial properties. He was a loving man with a wonderful sense of humor and always knew how to make someone smile. The family will receive friends and family at Zacharias Funeral Home in Deposit on Thursday, April 4th from 4pm to 7pm. In lieu of flowers donations can be made in Burt’s name to St. Jude Children’s Research Hospital. Condolences may be expressed at www.zachariasfuneralhome.com. To plant a tree in memory of Burdette D. Lee, please visit our Tribute Store. "Email Address" would like to share the life celebration of Burdette D. Lee. Click on the "link" to go to share a favorite memory or leave a condolence message for the family.